On May 3rd, Congress authorized the creation of a Naval Department. This was done to help prepare the United States for war with France. In July 1789 a mob stormed the Bastille and the French Revolution had began. In its early stages American were clearly enthusiastic about the Revolution, feeling rightly that the French had taken the American Revolution as a model and were now revolting against their own royalty. Those views began to change as the French Revolution turned bloody and the guillotine soon became the method of ensuring conformity of views on the revolution. The American public was no long enthralled by the Revolution. The French Revolution was not confined to France however. Within a short time the other European powers tried to intervene, fearing that the Revolution would spread to their own monarchies. The French demanded that the United States come to its aid based on the American French Treaty of Alliance of 1778. The reality however, was that the United States was dependent on Great Britain for 75% of its trade, and was in no position to become drawn into a European War. 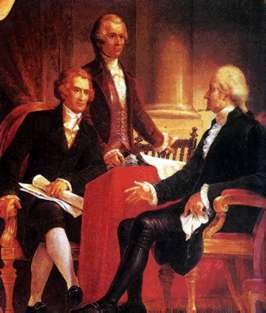 Secretary of State Jefferson, who had spent time in France, tried to influence Washington to side with the British, but the ever-pragmatic Secretary of the Treasury Hamilton favored staying neutral. Washington decided to recognize the new Revolutionary government in France, and then claim that since it was a new government the United States was not bound by its treaty obligation. Washington therefore announced a policy of neutrality. The US would remain neutral in the war between France and England. The neutrality would be a difficult policy to maintain as Washington’s successor would learn.